The Bartered Bride taught us that Czech peasants are adorable. Janáček’s Jenůfa teaches us that they (or at least the Moravian variety if we want to be real precise) actually are evil. Neither of Jenůfa’s men seem like good catches, and her mother kills Jenůfa’s baby. This is not a happy opera. Like in some similar works, it is the angelic light emitted by the female protagonist and the glow of the music’s lyricism that makes it more than just an exercise in misery. Some rough edges were still showing at Monday’s first performance at the Staatsoper this season, but the cast of Angela Denoke, Agnes Baltsa, and co. is good, the production simple and effective, and the conducting promising, so: worth seeing. Well, it’s Janáček, so of course it’s worth seeing. But that’s just my opinion. Janáček, Jenůfa. Wiener Staatsoper, 5/9/2010. (In German.) 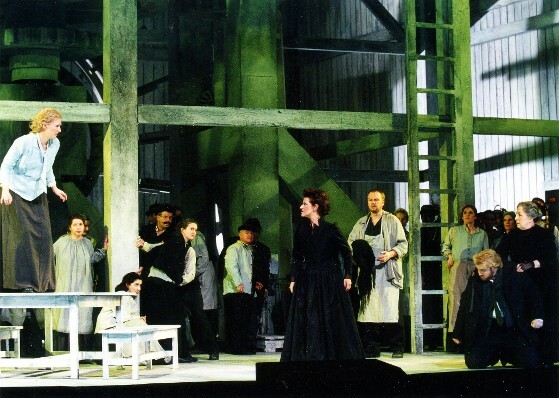 Production by David Pountney (revival), conducted by Graeme Jenkins with Angela Denoke (Jenůfa), Agnes Baltsa (Kostelnička), Jorma Silvasti (Laca), Marian Talaba (Števa). The biggest shock for me was when Jenůfa started singing and I could understand what she was saying. Somehow I missed that the Staatsoper performs this opera in a German translation. Janáček approved of it, but it’s still no good, in my opinion. The rhythm of the text feels entirely different from the original and much clunkier, no longer in tune with the musical line. Comprehensibility seems to come at too high a cost in this case. Luckily the new production of Kat’a Kabanová, coming in June, will be sung in Czech. This Staatsoper run is going under the fancy name of a Wiederaufnahme, which means it got more rehearsal than a regular repertoire performance. The could be seen in the better-than-average direction of David Pountney’s straightforward production. It probably helped that three of the principals were back from the 2002 premiere as well. Musically, there were hiccups. I suspect some of the singers sounded better in 2002. Graeme Jenkins’s conducting had some lovely poetic moments and a good general feel for the music’s pace, particularly in the start and end of the opera. This was more a lyrical reading than a folksy one. But a few sections sounded shaky or tentative, and the chorus and orchestra were separated a bit in Act 1. The end of Act 2, staged as a frozen tableau, needed more tension to convince. The orchestra, though, was on decent behavior and I suppose it will all get better later in the run. Angela Denoke is an excellent Jenůfa. Her voice is well-controlled but not naturally beautiful (the white, straight-tone high notes in particular are an issue), but she is so wonderfully expressive that this does not seem to matter. She gives the impression of living in this music and role, her singing and acting always working as one. Her Jenůfa is never cloyingly naive, but pure goodness. Agnes Baltsa is immensely popular here and her performance falls into the same general category as Denoke’s–more memorable as a whole theatrical experience than as a vocal one. Her Kostelnička is a formidable, and yet more sympathetic and less monstrous than many. But, and I’m in the minority here, I find her singing just too ugly. The lower half of her voice has a nasal tinge and the upper half is threadbare. I’m not sure why Denoke was so convincing to me and Baltsa ultimately was not, but that’s how it was. The men were on the weaker side of things, with Jorma Silvasti as Laca sounding excellent and solid until he had to sing anything above the staff and then there was trouble. He is a fine actor, though. Marian Talaba, the only principal member of the cast not in the 2002 premiere, struggled through Števa with an effortful, forced tenor and self-conscious acting. In the smaller roles, Caroline Wenborne stood out as Karolka, producing what really were the most beautiful and healthy tones of the night. David Pountney’s production is austere and generally effective. 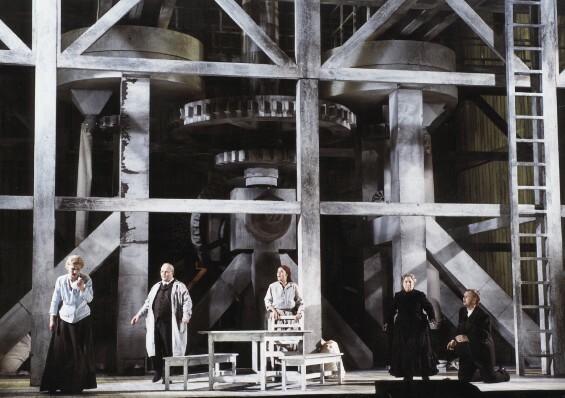 The unit set of dull gray walls is elaborated by a complex mill wheel in Act 1 (which turns with the woodblock’s ticking, whatever could that mean? better get the Subtle Symbolism Detectives on the case), lots of bags of grain in Act 2, and just a wedding feast in Act 3. It is very dreary and I missed the element of nature and the outdoors you associate with this sort of opera, but it works well enough. Personenregie was naturalistic, fairly detailed, and respectable. I am not sure, however, why the wedding guests started smashing dishes in Act 3, and it did seem to distract from Jenůfa. Costumes, like the sets, are monochromatic, except for Act 3, and show obvious but sensible characterization. The lighting design is nice, though sometimes the shifts were too quick. Ultimately this didn’t have the cataclysmic payoff that Jenůfa can, but it’s still good. Look for it to improve over the course of the run. Standing room was deserted, so you wouldn’t even have to wait for long to get a good spot. Further performances on 12, 15, 19, 22 May. Sorry for the crappiness of this review, I’ve been strung out on allergy medicine all week and can’t think straight. This was a singularly appropriate opera to see when part of my face was still a little puffy and weird, though. Also, does anyone else want to see a Jenůfa set in the rural American South? Or maybe with Mormons? Creative American Opera House, make it happen.